a bronze propeller, are immersed in an electrolytic solutions such as seawater. transfer of current results in the deterioration of the less noble metal. 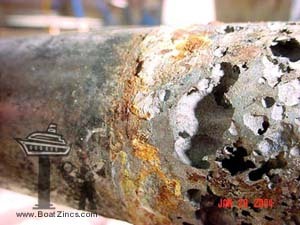 Zinc is one of the least noble metals in existence; and by properly attaching it to your hull, propeller shafts, rudders, trim tabs and engines, corrosion is confined to the zinc itself. Periodically inspect your sacrificial zincs and replace them when they have been reduced to half of their original size. Pitted stainless steel shaft from lack of galvanic protection.